Gulp baits are available for a variety of species, including panfish. Berkley Gulp bait is an artificial lure available in a variety of shapes designed to resemble live baits, such as minnows, grubs, shrimp and worms. The baits are infused with chemicals to produce a scent that mimics the real thing. Each Gulp bait is designed to imitate the movement of its natural counterpart in the water. Rigging a Gulp bait, whether minnow, worm or shrimp, is precisely the same as rigging the real bait. Berkley claims Gulp baits outlast real baits in the water. Tie a hook slightly smaller than the chosen Gulp bait to the end of the line a few inches below the rod tip using a clinch knot. Illustrations for tying a clinch knot are linked in the Resources section. Rig minnows and nightcrawler worms through the head with the hook point and thread the hook downward so the barb emerges below the bait and points toward the rod. Minnows can be rigged through the lips in this fashion. For a weedless presentation, pierce the tip of the minnow or worm head with the point of the hook, then guide the bait along the shank of the hook until the barb protrudes from the belly of the minnow or below the midsection of the worm. Turn the hook around and stab the barb back into the Gulp bait to conceal the point. 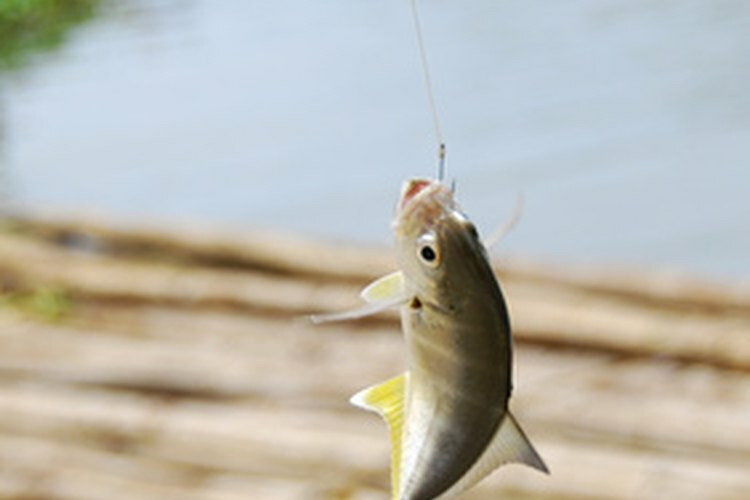 Rig shrimp Gulp baits by piercing the head of the lure with the hook, then guiding the hook inside along the natural curve of the bait so the barb remains inside. Rig grubs and smaller Gulp baits by piercing two or more of the baits with the hook at the midsection so the ends can wriggle on either side. Rig mussels, clams and cut bait chunks of Gulp bait by burying the hook inside the soft, round body of the bait, concealing the barb inside.